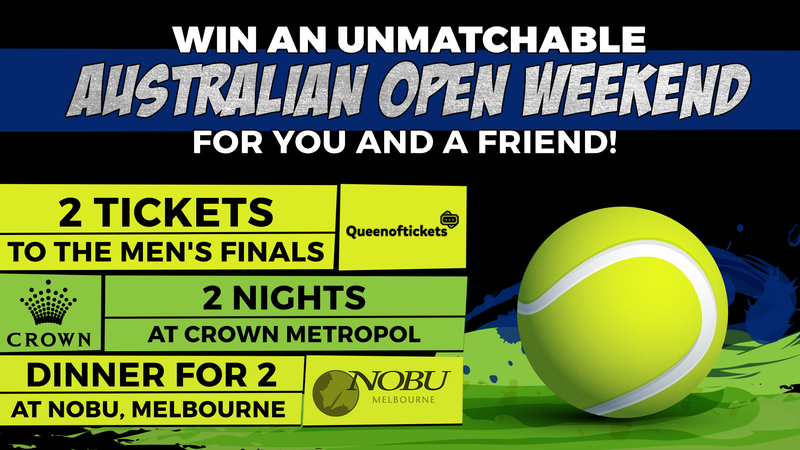 Win a Men's Finals Australian Open weekend for two people - Catch - 25 wol. Like all Aussies, we’re Australian Open mad this time of year! To celebrate, we want to give you the Australian Open weekend of a lifetime! You and a friend will enjoy two nights accommodation at the luxurious Crown Metropol. Enjoy dinner on us with a $200 voucher to spend at Nobu Melbourne on Saturday 26th January 2019. Top off the weekend with 2 of the best tickets to watch the Men’s Finals on Sunday January 27th 2019 at the Australian Open! To WIN, tell us in 25 words or less, who deserves to join you for an unmatchable Australian Open weekend and why? Competition Closes 11.59pm Wednesday 9th January 2019. The winner will be announced on our LIVE SHOW on Friday 11th January 2019 2019! Make sure you watch the show to find out if you are the winner! A 2-night stay at Crown Metropol on Saturday 26th and Sunday 27th January 2019.